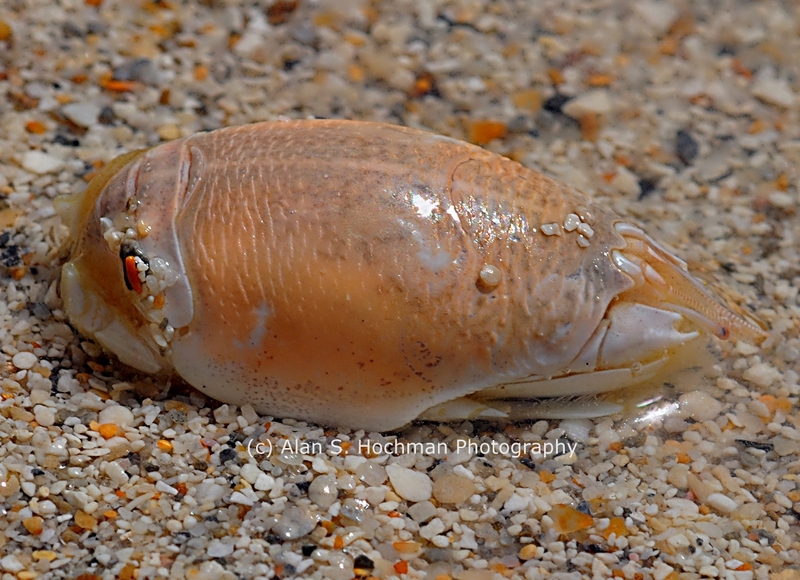 This is a photo of a mole crab, also called a Sand Flea taken at Bakers Haulover Beach on Collins Ave in Florida. This picture was taken with a Nikon D90 camera body attached to a Nikkor 60mm 2.8 lens on a bright sunny day. Mole crabs, of the genus (Emerita) are small decapod crustaceans. These are small animals that burrow in the sand in the wash zone and use their antennae for filter feeding. Mole crabs (or Sand Fleas) are small crustaceans that live their lives buried in the sand, in the “wash” or intertidal zone, which is that part of the beach where the waves start to collapse on the beach and goes up the beach as far as the waves go. The intertidal zone is basically where the white water crashes on the beach to the end of the dark, wet area of sand up the beach. Emerita has a barrel-shaped body. It has a tough exoskeleton and can hold its appendages close to the body, allowing it to roll in the tidal currents and waves.It has feathery antennae, which are used to filter plankton and detritus from the swash. Males of this genus are typically smaller than females, and in some species, such as Emerita rathbunae, the minute males live attached to the legs of the female.Females are around 8–37 millimetres (0.31–1.5 in) in carapace length, depending on the species, while males vary from a similar size to females in E. austroafricana, down to 2.5 mm (0.098 in) carapace length in E. rathbunae and E. talpoida. The mole crab is adept at burrowing, and is capable of burying itself completely in 1.5 seconds, and unlike mud shrimp, Emerita burrows tail-first into the sand, using the pereiopods to scrape the sand from underneath the body. During this action, the carapace is pressed into the sand as anchorage for the digging limbs. The digging requires the sand to be fluidised by wave action, and Emerita must bury itself in the correct orientation before the wave has passed in order to be safe from predators. As the tide changes, Emerita changes its position on the beach; most individuals stay in the zone of breaking waves.This may be detected by the physical characteristics of the sand. As the tide falls, the sand is allowed to settle; when Emerita detects this, it uses the temporary liquefaction from a breaking wave to emerge from its burrow, and is carried down the beach by the wave action. Cool background info about the habits of this creature! I wish I can see and touch it! I’m impressed and you did a fantastic job. Thank you for sharing. I really love your photo!